Personal injury law is one of the most common areas of law, but it is also complex. It is very difficult for non-lawyers to determine what to do in a situation where you or a loved one has been hurt, and it is hard to tell whether you may have a legal case. Fortunately, accident injury lawyers can assist you in investigating and filing claims in many different types of personal injury claims. Personal injury law firms often handle a wide variety of cases from car crashes to dog bites. 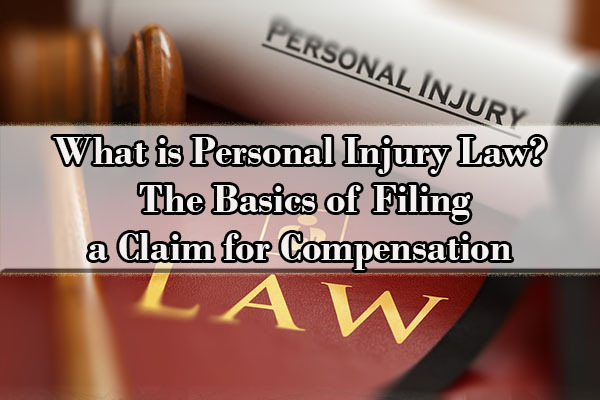 This article seeks to answer that question and briefly explain some personal injury law basics. There is no single personal injury definition because there are many different types of personal injury cases. Generally, a personal injury is a legal term for an injury to the body, mind, or emotions, as opposed to an injury to property. Anything that makes your self suffer harm could be considered a personal injury. Some of the most common personal injury case examples include a back or neck injury after a car accident, a dog bite, a surgeon’s error during an operation, or even an injury that occurs at a construction site. Often referred to as “tort” law by personal injury claim lawyers, personal injury law covers all possible situations where a personal injury has been caused either intentionally, such as an assault, or as a result of someone else’s negligence or carelessness, such as a car accident. Personal injury lawsuits can also include wrongful death claims brought by the victim’s close family and loved ones in a situation where a terrible injury proves to be fatal. 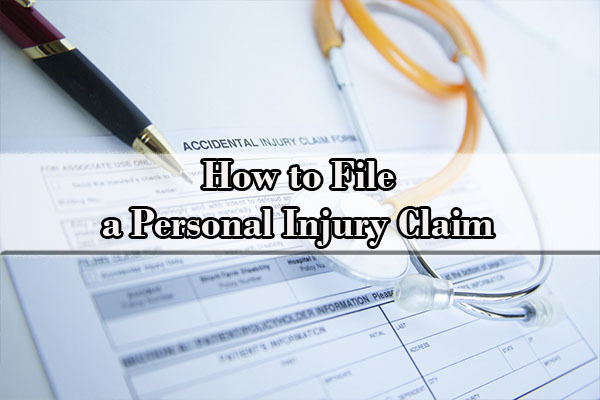 Personal injury lawsuits involve a personal injury victim filing a civil lawsuit against the person or organization responsible for causing the injury. Unlike criminal law, the government is not involved in prosecuting the offender. Instead, the victim must come forward and seek compensation, which is usually in the form of money damages, for the harm caused. If you plan to file a personal injury lawsuit, you should seek the advice and assistance of an experienced personal injury attorney. The fundamental basics of personal injury law are that someone else has injured you, and therefore, you are entitled to compensation from that person for what you lost. There are four essential elements of any personal injury claim: a pre-existing legal duty, the Defendant’s breach of that duty, that an injury occurred, and the breach of the legal duty caused that injury. For example, a driver of a car has a legal duty to operate a vehicle safely and within the traffic laws of the city or state he/she is driving in. If a driver swerves all over the road while drunk and hits a pedestrian, causing an injury, the driver has violated his legal duty to drive safely and caused an injury. As a result, the driver can be sued by the pedestrian he hit. When the injured person, also known as the “Plaintiff” files a lawsuit against the person or company who is legally responsible for the accident, also known as the “Defendant,” the Plaintiff can seek money damages for compensation. The Plaintiff will file a lawsuit against the Defendant directly, but in many cases, the Defendant’s insurance company will be responsible for payment. Not all personal injury lawsuits go to court for trial. In many cases, a damages award can be agreed upon after a negotiated settlement. As briefly mentioned above, if the victim of an injury died or is incapable of filing a lawsuit, the victim’s relatives can file a claim on behalf of the injured person. Finally, it is important to remember that personal injury Plaintiffs have a deadline to file their lawsuits after an injury occurs. This deadline is known as the “statute of limitations.” The statute of limitations deadline is best thought of like a stopwatch. The clock for the statute of limitations starts as soon as the injury occurs, or as soon as the Plaintiff should have realized that he or she was injured. The court will stop the stopwatch when the dead passes, and once the deadline passes, no claim can be filed. In New York, the statute of limitations for personal injury cases is generally three years; however, that time limit can vary depending on the type of injury involved. For example, if the Plaintiff plans to sue the government for an injury (perhaps involving a city bus crash or a slip and fall in the subway), the Plaintiff must provide the government notice ahead of time. As a result of the statute of limitations, it is very important to discuss your claim with a personal injury attorney as soon as possible. There are many different types of personal injury cases that could be brought by a Plaintiff. As explained above, almost any type of injury can form the basis of a personal injury lawsuit, but some types of claims are more common than others. Therefore, it is important to be able to differentiate between them. The most common type of personal injury claim is a negligence claim. A negligence claim involves a claim that an injury victim was hurt due to an accident that occurred because the Defendant acted carelessly. The most common example of a negligence claim is a car crash; however, many other types of injuries could arise out of negligence such as a medical error or a slip and fall in a store because the store owner forgot to place a sign warning of wet floors. New York follows the rule of comparative negligence. Under New York’s pure comparative negligence statute, any person who has been injured by an accident can sue any responsible party, even if he or she was partially at fault for the accident. When the Court or Jury assigns personal injury damages, the injured person’s damages award will be reduced by the percentage of fault that is attributable to the victim. For example, if during a car crash, the Defendant was 90% at fault for swerving into the Plaintiff’s lane too quickly, but the Plaintiff was 10% at fault for being on her cell phone while driving, the Plaintiff’s final damages award will be reduced by 10%. If you or your loved one has suffered an injury, whether or not it falls into any of the categories discussed above, you may still have a case. Consult a personal injury attorney to know what action you should take to file a claim. Your first step in the process will be consulting with an attorney about your case. 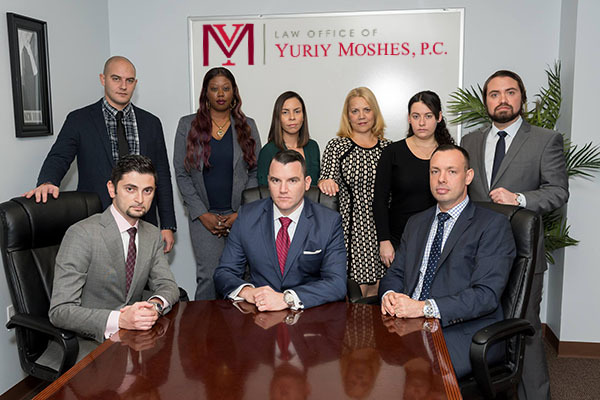 Call the Law Office of Yuriy Moshes for a free consultation so that one of our experienced personal injury attorneys can help you evaluate your options. After the initial consultation, your personal injury attorney will thoroughly investigate your case. It is important to document the circumstances of your injury as well as possible. Gather and preserve any evidence you have of both wrongdoing and your damages. This would include photographs or police reports from the accident scene, lists of potential witnesses, and copies of your medical records and medical bills. Once your attorney has sufficient information to file a claim, he or she will issue a demand for settlement, including a demand letter outlining your case and damages. The letter is then reviewed by either the opposing party or the opposing party’s insurance company, who will either accept or reject the demand. Generally, the demand is rejected, but early settlement can often be accomplished through continued negotiations. If negotiations fail to produce an early settlement, your attorney will file a lawsuit on your behalf. The first phase of the lawsuit is called the pleading stage, during which the parties will exchange legal briefs that outline the nature of the case. Pleading can be very difficult for unrepresented parties to conduct properly according to the court’s rules, and so it is very important to hire an attorney to assist you in filing. The second phase of the lawsuit is known as discovery. During this stage, both sides will review all of the evidence and evaluate the merits of a pre-trial settlement. In some cases, a mediator, who is often a current or former judge, will conduct a mediation between the parties to facilitate settlement. Mediation is a relatively informal proceeding in which the parties engage in a structured negotiation. The third and final stage of the process is the trial itself. If the claim has not yet settled, a jury will hear your case, evaluate the evidence, and determine fault. If the jury finds in your favor, you will be awarded damages. If the trial does not turn out in your favor, you should discuss the possibility of an appeal to a higher court with your attorney. What Compensation Could I Get for a Personal Injury Claim? The amount of compensation and damages is always decided on a case-by-case basis. The nature and extent of your injury as well as many other factors could influence the overall amount of the award. Additionally, if the injury resulted in a death, certain additional wrongful death damages may also be awarded. In very extreme cases, punitive damages may also be awarded. Punitive damages are awarded to punish Defendants for their bad behavior and deter others from taking similar actions. Awards of punitive damages are most common in intentional torts cases (such as assault claims), but may also be awarded in some negligence cases where the Defendant’s actions were particularly reckless. Auto accident personal injury cases are one of the most common types of claims brought in court. In general, a driver can be held liable for his or her negligent acts on the road, and the personal injury victim can collect compensatory damages from the driver’s insurance company. When preparing to file an auto accident claim, it is important to collect the names and contact information of the driver and any witnesses to the crash as well as the name of the police officer responding to the crash and his or her badge number. Also try to remember to take pictures of the accident if possible, but remember that your medical needs come first. Finally, keep a record of all of your medical expenses, including ambulance bills, hospital fees, and post-treatment records such as chiropractic care. Medical malpractice claims are also commonplace in the United States, and can arise out of many different circumstances. Unfortunately, while doctors, nurses, and hospitals have the best of intentions, negligent mistakes do occur in many different ways. Hospitals in particular can be very dangerous places. One type of injury would involve an error in treatment or surgery. Another could include the improper prescription of medication. Finally, a medical malpractice claim can involve the failure of a medical device or medical equipment. Medical malpractice cases are some of the most complex cases brought in modern courtrooms, and so it is extremely important to speak with a personal injury attorney with medical malpractice experience before trying to file a claim. Another very common personal injury claim are dog bite or animal attack claims. As a general rule, pet owners are financially responsible for any injury caused by their pets if the pet was poorly supervised. In the case of dogs specifically, strict liability flows to the owner of the dog for any vicious bite attacks. In New York, the owner of a dog that has previously been found to be dangerous is automatically liable for any personal injury caused by the dog. In 2012, Steve Hanna (name changed to protect his privacy), a 48-year-old mechanic, was standing on the sidewalk at the corner of Queens Blvd. and Woodhaven Blvd., waiting for the traffic light to change. As the light on Queens Blvd changed from green to yellow, a truck making a left turn failed to yield to a car going straight. The front of the truck struck the rear left corner of the car, causing the fast-moving car to spin around wildly. The car veered toward the sidewalk and barreled into Steve, pushing him through the plate glass window of a restaurant at the corner. The combination of Queens Blvd’s immense width and heavy automobile traffic has made it one of the most dangerous thoroughfares in New York City. It has earned city-wide notoriety and morbid nicknames such as “The Boulevard of Death” and “The Boulevard of Broken Bones”. In fact, from 1993 to 2000, 72 pedestrians were killed trying to cross Queens Blvd, an average of 10 per year, with countless more injuries. Steve was now among its victims. Steve’s injuries were profound and terrible. His left leg was severed just above his knee. His right leg was crushed. After 18 surgeries, hundreds of agonizing physical therapy sessions, and dozens of infections, he has a prosthetic left leg, and his right leg has multiple plates and screws in it. Steve’s economic losses were relatively easy to project. Steve retained doctors, a vocational rehabilitation expert, a life care planner, and an economist to establish that Steve was permanently disabled and to calculate his lost earnings. However, the pain and suffering that Steve endured was incalculable. Through witnesses, doctors, and a videographer who filmed a video of a single day in Steve’s life after the accident, he was able to present a compelling picture of his suffering. Because the truck company had no assets, Steve was limited to the available insurance. After three years of intense litigation, the defendants’ insurance companies offered the full amount of two liability policies, $6 million. If the truck company had $10 million of liability insurance, Steve may have gone after it. Frankly, no amount of money was sufficient to fully compensate Steve for his pain and suffering and loss of enjoyment of life. Steve’s story illustrate how many factors go into computing the value of injuries sustained in accidents. Have you been injured recently due to the fault, carelessness, or negligence of someone else? Do you know whether or not you may have a claim for compensation for your personal injury? We will stand with you through the claims settlement process and even argue on your behalf in court. Our law firm represents clients in the greater New York City area including all of its boroughs (Manhattan, Brooklyn, Queens, the Bronx, and Staten Island) as well as Northern New Jersey, Long Island, and upstate New York.